A gentlemen named Toby reached out to me from DK Publishing in December of 2014. He found me by way of posts I contributed in various LEGO communities and a small parts store I run on BrickLink. Toby was writing a book about great LEGO sets throughout the company’s history. It was apparent I owned some of the sets Toby was looking for photographs of for the book based on the inventory I listed. 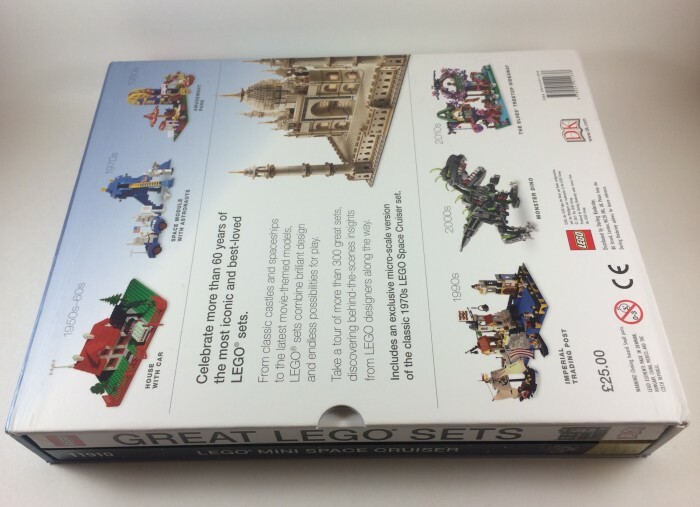 At the time, the title of the book (“Great LEGO Sets: A Visual History”) wasn’t even finalized. Toby asked for shots of multiple sets I’d collected over the years and from my childhood. Of course, I obliged. Toby was incredibly gracious, responsive, and helpful. Everything you’d want someone interacting with a fan community to be. Getting a copy of the eventual book was quite a surprise, a year later. 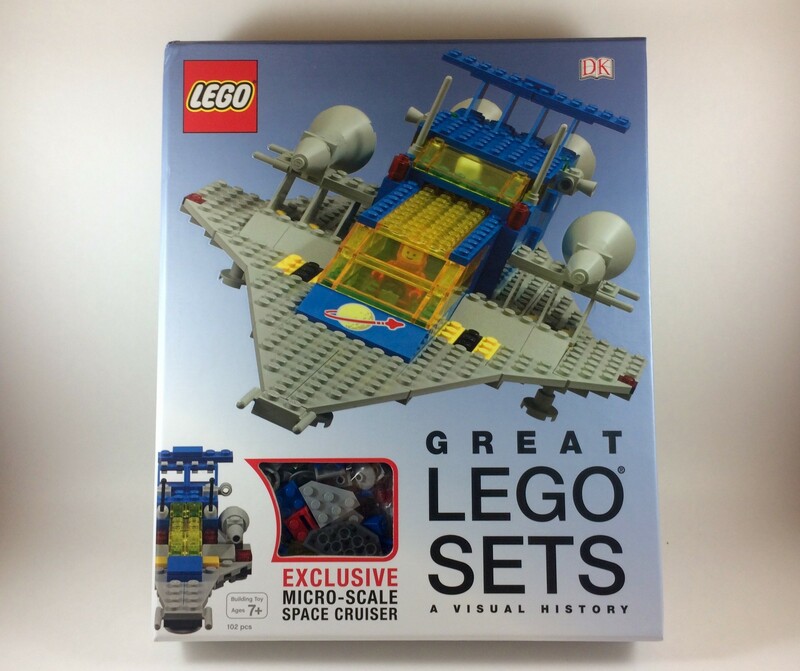 DK Publishing’s “Great LEGO Sets: A Visual History” will be available October 8 in the U.S. (you can order now via this Amazon affiliate link). 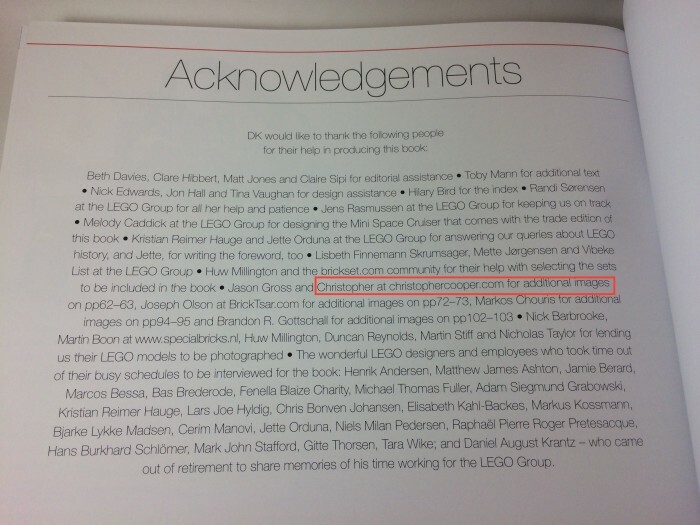 Like many other LEGO community fans and supporters, I helped contribute to the massive undertaking that DK’s LEGO books tend to be. 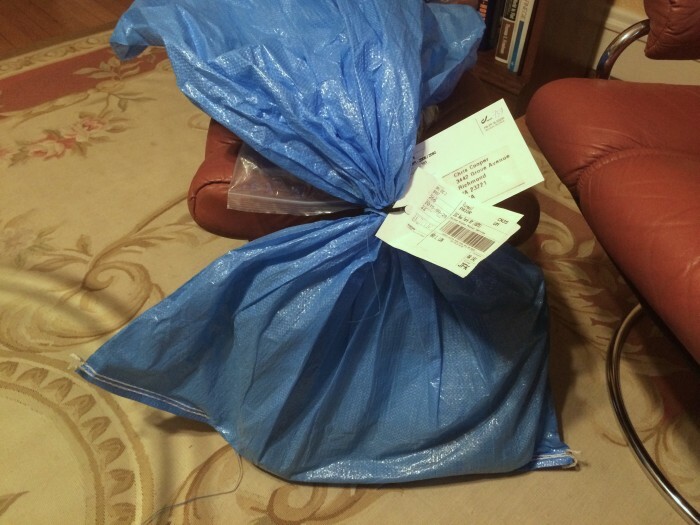 The 256 page book weighs in at just over 5 pounds with thick cardboard sleeve and heavy weight pages. It includes a 102 piece “micro scale space cruiser” model which is a homage to the Classic Space model #487 / #982. The combination makes for a significant book: it feels like you’re getting a lot despite the high price tag. What’s so impressive about this book to me is that it’s a culmination of community participation. 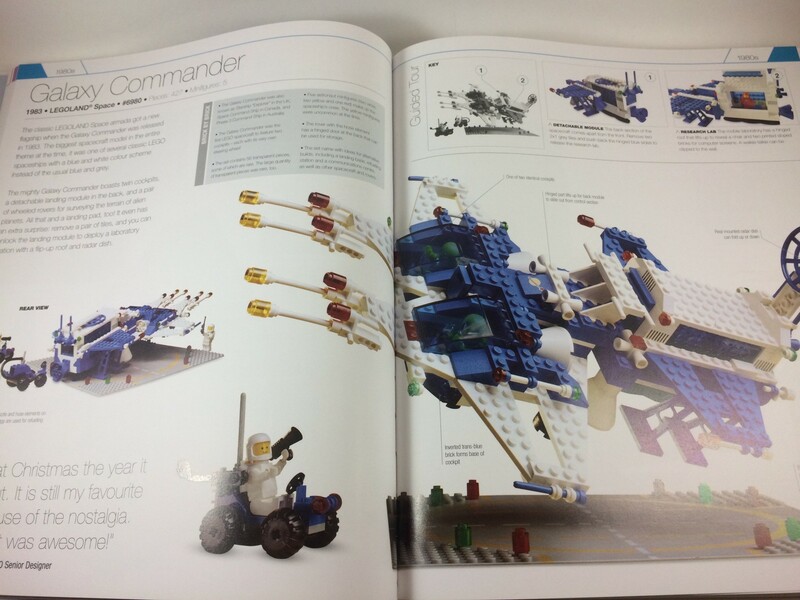 The book spans the history of plastic brick based LEGO with all the major sets over the last several decades. Well known, nostalgic sets get a full centerfold spread. DK can’t source the hundreds of sets required for such a project in-house and so they reach out to the community. The AFOL community has grown, seemingly exponentially, in recent years. It’s great to see third-parties, like DK, not only leveraging the growing interest as a company, but also supporting it. 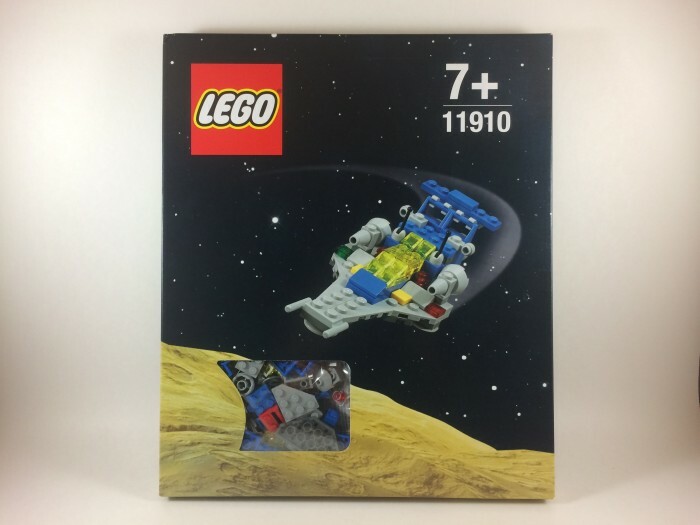 LEGO itself should be commended as they’ve cleared supported DK and the fan community with special releases like the micro scale Space Cruiser #11910 with this book. This micro scale model represents a very rare set from 1979 that just about every kid wanted to find under their Christmas tree during that time. These days, the original model, is highly collectible. Even a thoroughly used set goes for hundreds of dollars. DK including this model as the source of the micro scale version with the book is a hat tip to the AFOL community. Like so many, I wanted to grow up and become a LEGO designer as a kid. The BBC’s channel 4 recently had a feature, “The Secret World of LEGO“, on just that topic. There’s lots of experienced engineers and designers out there now that grew up with LEGO and are vying for one of the few sought after positions in Billund. LEGO has created an entire theme—originally CUUSOO but now dubbed “Ideas“—to accommodate the community’s wish to participate in the design process. This benefits both parties: LEGO gets free initial designs with proven interest and the community gets to see their dreams come to life. This was my small opportunity to revel in the world of LEGO again. Seeing my name popup in the Acknowledgements meant more than such a silly couple of words ought to (I’ll forgive the typo in the domain name “christopherrcooper.com”). But it’s just that feeling that DK can leverage to their advantage: nostalgia in the community. We all love our childhood toys. Many of us have turned them into much more than a toy: a hobby, art, decoration, an activity with our own children. If LEGO, through the community participation and third parties like DK, can keep the positive emotion and nostalgia flowing, there’s a bright future ahead. We might even avoid a repeat of the dreaded early 2000s LEGO era. With fond thoughts of all the childhood LEGO you desperately wanted but never had, dear reader, I’ll leave you with the centerfold photoset DK created from my contributions to 1983’s Galaxy Commander #6980.